Your Marketing analyzes system modules according to their use. This tool shows your activity in SALESmanago and unexploited areas. 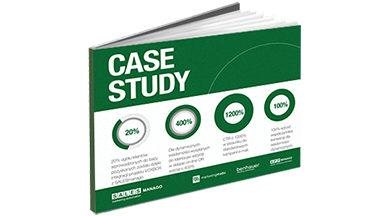 The details of individual segment indicate the number of active elements for example, in the email marketing the number of sent periodic emails or in Social Media the number of planned campaigns. You can compare available features and check the intensity of their usage and regularity in chosen time period. 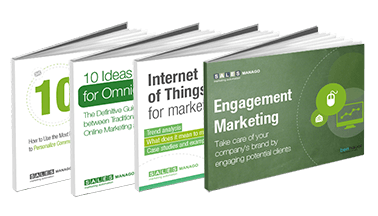 The more tools you use in marketing processes, the better results you achieve. Your Marketing shows which of them you should apply in order to fully utilize capabilities of the system. Date – in the upper part of the screen, on the right side, you can choose the data for a particular date. 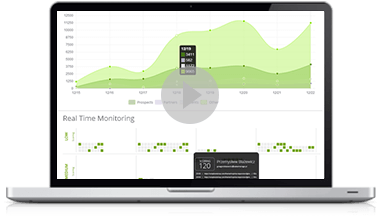 The system will generate the statistics of your marketing processes from the selected date. 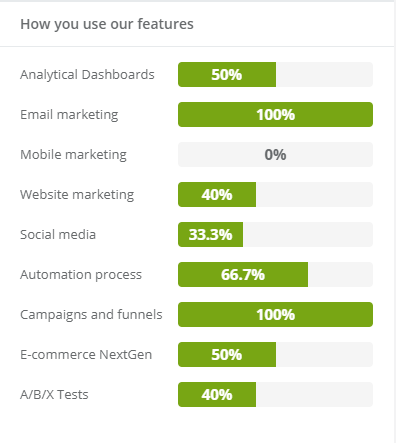 How you use our features – on the left side of the screen you can see the display of the analytics of areas that you use. Next to the area name the percentage values of using each of them display. If there is a lock icon instead of percentages, It means that this module is unavailable for you. It is necessary to buy an access in order to activate the feature. Here you can find information how to use available features from a particular segment. At this place, you can manage them, hide their preview and filter them according to features groups. Tips – the list of described features. 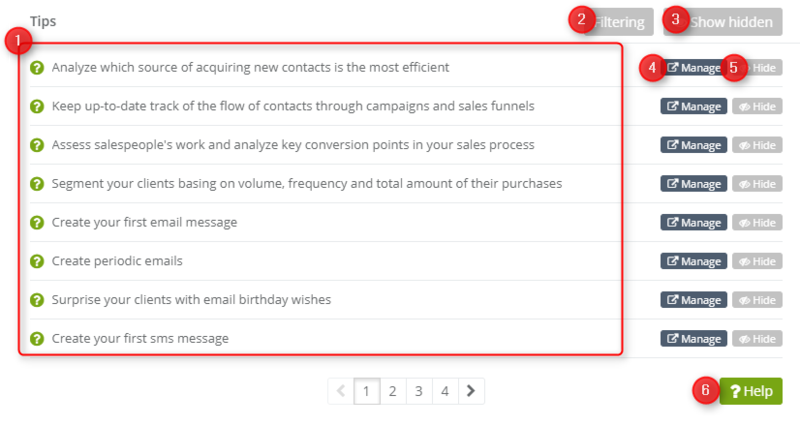 Filtering – you can filter the list according to certain areas. After marking the chosen areas, the only features that are included in them will display. Show hidden – clicking this button you can bring previously hidden features back. Manage – the button redirecting you to the settings of a particular feature. Hide – If there is a tip you are not interested in, you can hide it on the list. Help – If you do not know what particular features are for, you can be redirected to support where there are articles about all system options. Below you can see the blocks with information of the particular feature in certain areas. Right next to the feature name the number of usages will display. 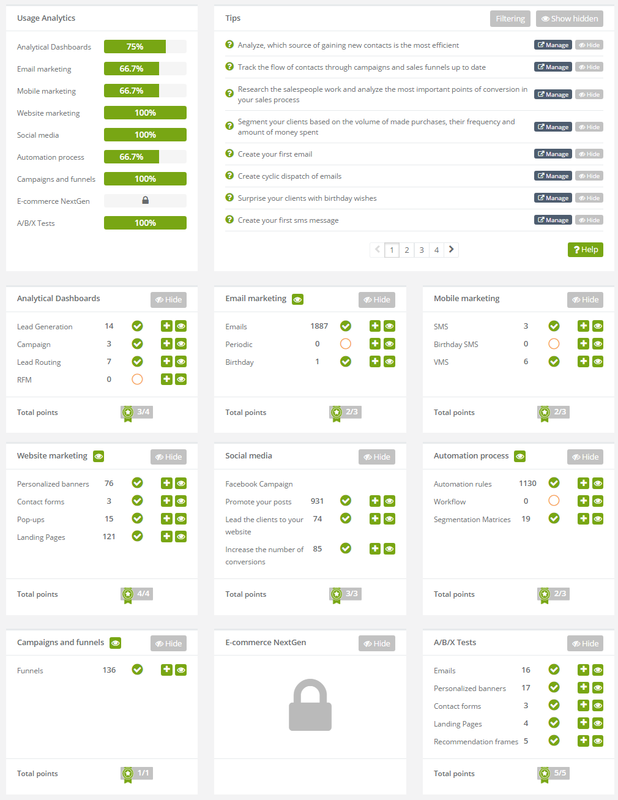 In the example above, there are two Lead Generation dashboards created and one Campaign dashboard. If the feature is used, then next to the number you will see the green circle. If the feature is not used (above It is Lead Routing and RFM) then the circle will be empty. Clicking the plus icon you will be redirected to a particular feature setting. After clicking the eye icon, you will be redirected to the main screen of the feature, where you can see the list of already created ones. Total points – here you can see how many of available features you use. 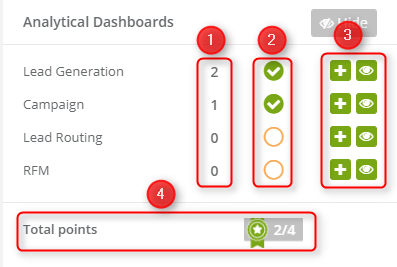 If in one area there are 4 features and 2 of them are set, it means that your score amounts to 2/4, that is 50%. REMEMBER: the more features you have configured in SALESmanago system, the more you can achieve with marketing automation.